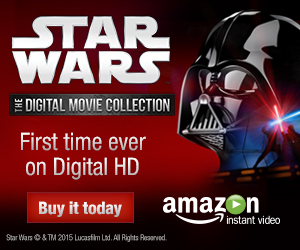 Where there is crossover, there is tie-ins, of course. Respectably Dark Nights: Metal shows far greater restraint than any number of events (it's minuscule in the face of War of the Gods or Blackest Night), so seven "Nightmare Batmen" specials and a one-off with contributions from Grant Morrison is a small price to pay. 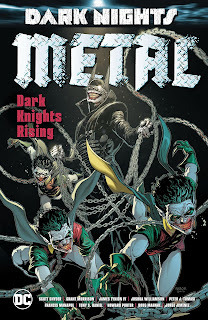 Still, to read Dark Nights: Metal: Dark Knights Rising is assuredly to understand that this was a series that needed to have been collected in three volumes in reading order. Having now read Metal proper, Rising's mysteries are muted and its shocks don't have the same effect. There's some fun to be had here, but the stories would have been stronger in their places and their unavoidable formulatic-ness shows through too much. Scott Snyder's clever Metal conceit is that the Dark Multiverse Batmen who attack our world are each an analogue for another Justice League member, so these are nightmare Batmen but they're also nightmare Leaguers -- Batman plus Superman, Batman plus Wonder Woman, etc. (plus Batman plus the Joker). What we get here then is an interesting litany of the worst-ever Batman team-ups -- what if Batman fought the Flash, what if Batman fought Cyborg, and so on. And Rising kicks this off in the best possible way, with the Batman/Flash story, "The Red Death," written by regular Flash writer and artist Joshua Williamson and Carmine di Giandomenico respectively. If "Red Death" is not the best of these stories, it is at least among the best executions of the concept. Di Giandomenico makes it look authentically like a Flash story, and Williamson cameos some of "our" Flash's supporting cast, slipping this between the pages of current events. In that way, this is not just a cash grab origin of one of Metal's side villains that may or may not really have needed to be told, but instead it's got a tie to the here-and-now and (minor) importance for regular Flash readers. It's Williamson's fortune to go first, however. The arc of "Red Death," we come to find, subsequently repeats over the Cyborg "Monster Machine," Green Lantern "Dawnbreaker," and other stories -- the nightmare Batman defeats his teammate, he or she is offered partnership by the Batman Who Laughs, they fight a hero of our world, the hero is whisked away by Dr. Fate before defeat. For a variety of reasons, including fitting between the pages of Metal, there's perhaps not another way to handle these, but setting them all one after another in their own volume like this, the stories grow swiftly predictable. Something fun about the stories, however, is that Snyder and company have mapped the Dark Multiverse Earths that these stories take place on to their equivalent "light" Multiverse Earths from Grant Morrison's Multiversity -- so, for instance, the female Aquaman-Batman "Drowned" comes from the Dark Earth-11, whereas in Multiversity Earth-11 is gender-swapped a la Elseworld's Finest: Supergirl & Batgirl. Some of the equivalents are not as clear, but part of that fun is trying to read into the choices, like Batman and Superman fighting on a Dark Earth-1 that might kind of be like the Earth One books, or Batman getting tricked into killing the Joker on Dark Earth-22, the dark opposite of the Kingdom Come Earth. Probably best of the specials, sporting a powerhouse team, is "Merciless" with Peter Tomasi and Francis Manapul. Manapul's in prime form, drawing a classic-looking (and in love) Batman and Wonder Woman amidst destruction one minute, drawing high-tech war rooms the next. Not only does Tomasi bring in DC's geopolitical finest -- Steve Trevor, Amanda Waller, Director Bones, Sam Lane -- but he's also got a military bomber overhead piloted by Green Lantern's Tom Kalmaku and the long-absent "Cowgirl" Jillian Pearlman, for gosh sakes. It's a good-looking and emotional story. Honorable mention too to Tony Daniel drawing the Superman/Batman/Doomsday "Devastator" story; the Doomed crossover had a lot of problems but Tony Daniel put his mark on that late New 52 era well. Admittedly I was expecting more from the "Batman Who Laughs" special, given that "Laughs" is clearly Metal's breakout star. James Tynion has proved himself on Detective Comics and I always want to see Riley Rossmo's art, but as with many of the nightmare Batmen, Batman's turn rogue is exceptionally thin. Joker's wanton killing is horrific, but that kind of thing would've driven Batman over the edge years ago if it worked (see also the death of Batman's family, Wonder Woman, Alfred, and so on). There are no great shocks to "Laughs" origins; how he kills both his own partners and the Kents are both disturbing indeed, but the story wanted for real detail -- how "Laughs" created his crazed Robins or what he did to Damian, for instance. The end of the book is buffeted strongly by the "Wild Hunt" special; I do agree that if the nightmare Batman books were going to be collected together, "Wild Hunt" belonged with them. I've dug all the Final Crisis shout-outs in Metal, so being back "on board the monitor shiftship Ultima Thule, en route to the heart of the multiverse" with Morrison himself is a particular thrill. It is not seamless -- the dialogue between Flash and Cyborg reads strained, and the cartoon-based Raven is painfully out of place -- but the parts with Detective Chimp sing. As well, tying it all together, I loved the nightmare Batmen's change of heart and that it comes down to Flash and Red Death; "We're a poison dart, fired straight at the heart of everything" reads like Morrison, and so does the pointed "There's always a sacrifice, Flash." Were this just the nightmare Batmen specials, this volume would be easier to dismiss, but "Wild Hunt" makes it something special. My going advice now would be to intersperse your reading of Dark Nights: Metal and Dark Nights: Metal: Dark Knights Rising; I'd have been much more gripped in "Batman Who Laughs" about the identity of the prisoner if I hadn't already read the (somewhat flat) reveal in Metal. These are good enough stories, no worse than the tie-in special genre; I can't say they added all that much to my understanding of Metal, but certainly -- for another -- I'd have also been more interested in Dr. Fate whisking the heroes away if it was all taking place more in the moment. I foresee an Omnibus edition with things placed in a more readable fashion a’la Infinite Crisis or Final Crisis. Sales and reaction to the whole Metal saga should warrant it. I’m still making my way through early Rebirth so looking forward to getting to this. For me tie-ins aren't about advancing the story, or adding layers to the main event, but enriching the event with fleshed out characters. Was the execution of the plotting predictable in every issue? Of course, but what I loved were the tiny insights to each evil Batman character that allowed them to push into the darkness. My favorite was Murder Machine. I absolutely loved the artwork and the Batman/Alfred relationship was heartbreaking.